Serving God's Children in Tanzania, Africa. Forgotten children-AIDS orphans, poor children, children of pastors and church workers, orphans and disadvantaged children, receive an outstanding education and loving care in a Christian community in Tanzania. By his own admission, when he first came to The Lion of Judah Academy ("Simba wa Yuda" Academy in Swahili) in 2002, Musa (not his real name) knew very little about Jesus, and wasn't terribly interested in school. Things in his life quickly changed?however today he still remembers, "Most of the people were kind of wondering and watching me to see, 'Is it true this guy has changed so much?'" 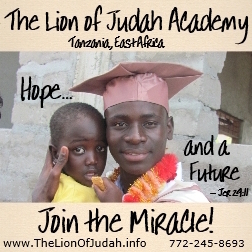 Now a university graduate Musa has returned to Lion of Judah Academy for a season, to give back to the school and the students, and get ready for what he believes is to come next in his life: attending seminary to prepare to be a pastor. Reflecting on the twelve years he spent as a student at Lion of Judah Academy, Musa reflects, "Simba wa Yuda has become a place of blessing for me. I will never forget it, and the so many things it has done?really. And that's why now I have decided to become a blessing for many?to come back and help the kids by teaching?doing other stuff?doing whatever I am assigned by the director." "The foundation I received from Mtebe (the school's director), Pili (the director's wife), and the other teachers?it really changed my life." Although Musa's parents are both living, they are divorced. His father has not been much involved in his life, and due to cultural expectations and norms, Musa has never been able to live with his mother and her present husband. As he slowly turns, looking around at the campus, he notes with a broad smile on his face, "I count this place as my home."